Is French Press Coffee Really All It’s Cracked Up To Be? For almost a century, coffee enthusiasts have come to know and love the French press. However, this method of brewing should be weighed carefully. Medical professionals are concerned about the adverse health effects associated with drinking French press coffee. Anyone who works in an office is familiar with the morning dread of walking through those front doors – Is my voicemail light blinking? Which deadlines are priority? How many e-mails have I racked up since midnight? It’s a feeling that creates mental chaos before even leaving the house. As consumers, we’ve become more and more picky about the coffee we drink. The majority of us are only willing to drink a high-quality brew, and want a number of options beyond black coffee. So what does this mean for the companies selling the coffee? Coffee Spending to Rise to $13.6B in 2016 – Is it Worth it? It’s no secret that Americans love coffee. For that matter, it’s no secret that the world loves its coffee. According to estimates from market research firm, Mintel, coffee spending will continue rising to $13.6 billion dollars this year. Did you know 59% of Americans drink a cup of coffee every day, and it often plays a big role in the working person’s world. It’s no surprise that its benefits have been studied over and over again. Not only does coffee help you be more productive at the office, but it’s also been proven to help fight against the risks of heart conditions, cancer, and Alzheimer’s disease. Would an office without coffee be a far less productive workplace? Are there benefits beyond productivity that a coffee service would provide? Here are the five key facts you need to know about how coffee impacts your workplace. Sometimes us earth-dwellers have it so easy. We can walk, jump, and run without fear of floating off into space, and we can take advantage of a quality coffee service to get our daily caffeine fix. How Does The Pope Take His Coffee? If you haven’t heard, the Pope is coming to the US this fall season. It’s been said he’ll be staying in several different church properties, parading down several major highways, and arranging coffee delivery from Belforte del Chienti, Italy. It turns out the Pope needs his home comfort in the form of good java. 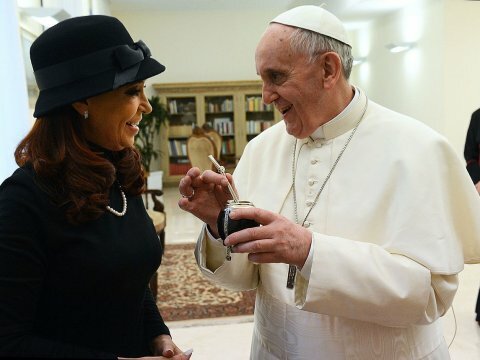 Tracey Allen, head of Specialty Coffee Association of America, was contacted for the Pope’s special coffee request, and has been conducting private taste testings for several months. It is said that Pope Francis is very selective about his coffee, understanding the multi-faceted process that takes place between production and consumption. Allen reveals Pope Francis is a big fan of fresh and local, so her company has been concocting a specialty “Pope brew” in hopes of satisfying the saintly father on his trek through the US. Fiji recently launched a commercial showcasing the pureness of their water, which got us thinking; where exactly does that water come from, and what makes it so pure? Turns out the successful water bottle company gets their aqua from a natural source on the island of Viti Levu, in the remote hideaway, Yaqara Valley. Similarly, Poland Spring gets their water from a natural spring in Maine, a state renowned for their freshwater lakes, ponds, rivers and streams. So what do these h20 coves have in common? They are untouched by other bodies of water, namely the ocean, and other people. These waters are undiluted, free from foot traffic, skinny dipping tourists, and hot-to-trot sea creatures.